Gutters are often the most neglected feature of a home, yet they are one of the most essential. Although you can’t see them working, they do much more to protect your home from moisture and water problems than you can see! Keeping them clear is vital, and with fall coming up fast, our gutter guards can help make clearing leaves and twigs a thing of the past. It’s important to first understand how gutters work without gutter guards installed. Gutters are designed to direct water flow away from a home. Although gutters are made to ensure proper water flow from the roof, certain things can get in the way of them doing their job. If your gutters aren’t checked out at least twice a year, the build up of leaves and other debris can clog your gutters, becoming a disaster waiting to happen. With this said, there is a way to ensure your gutter cleaning days are over. Ensuring your gutters are leaf-free requires regular cleaning, especially during the fall. However, if your home has gutter guards, you won’t have to worry about digging the ladder out of the garage so frequently. Gutter guards can be installed to your existing gutters and make your life much more convenient while eliminating a job from your outdoor chore list. They are essentially a gutter cover that is installed on the top of the gutter where leaves and twigs fall in and build up. 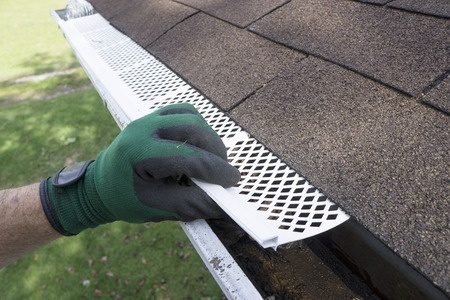 With breathable holes in the gutter guard, water will still flow into the gutter and away from the home while the gutter guards keep debris out. This investment can save you time from having to clean out the gutters, money on repairing broken gutters, and give you peace of mind. There are many different types of gutter guards to choose from, so be sure to enlist the professionals of Alaska Premier Gutters to help you make the right choice. Our experts can help you keep your gutters free of fallen leaves, debris, twigs, insects and more. We’ll keep your regular gutter system working properly and improve its longevity, thus making your investment worth every penny. Make sure your gutters are prepared to handle the weather this fall, and all the fallen leaves that come with it. This fall season, you can spend more time enjoying the big game or maintaining other features of your home that needs tending to – and which would you rather do? Call us today at 907-272-2337 to learn more about getting gutter guards for your home.